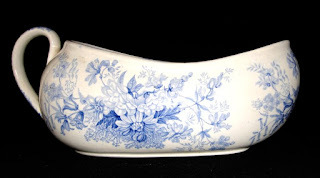 Dishy News - A Transferware Blog: WHAT IS A BOURDALOUE? A boudaloue is not a creamer. Or a gravy boat. It is sometimes referred to a ladies' coach pot. Named for an 18th century French priest, Louis Bourdaloue, who was popular but verbose, the combination of a cold church and a long sermon made this item a necessity for women. I hope you are beginning to guess its use. I created this blog to share with you the bits of history that I didn't discover in my school books. Did you know that women didn't wear underpants until late in the 19th century? The lack of underpants certainly made the boudaloue easier to use. Perhaps the underpants information is incorrect. Let me know. The bordaloue seen here was made by Minton in Staffordshire around 1830. The pattern name is "Arabesque." I imagine this required some creative maneuvering! I was familiar with a bourdaloue. A few years back on the BBC show "Cash in the Attic" the valuer came across a rather grand one which was gilt and handpainted. I think it was French porcelain if I remember correctly. Is this type of piece a rare form? Or did many just not survive when they outlived their private function? It would be interesting to find other forms which had a use that no longer exists. If they did wear underpants there were open from front to back where the center seam should go. Pantalettes is the term. They were open in the crotch, so that a woman didn't have to "drop her drawers" to relieve herself. They were created when the cage crinoline or hoop was developed. Until that time volume in the skirt was created by as many as 14 petticoats. These petticoats provided warmth and modesty. The hoop was a liberating garment, but women were no longer warm or modest, hence the pantalette provided both. I would appreciate another view of this item so I can learn to tell it from a gravy boat. I don't have another photo of the bourdaloue, but you'll notice that there is no spout. A gravy boat will have a spout for ease of pouring.